The Royal Canadian Mint offers the 2018 1 oz Silver Canadian Maple Leaf Lunar Dog Privy Coin to celebrate the Year of the Dog in the Chinese Lunar calendar. 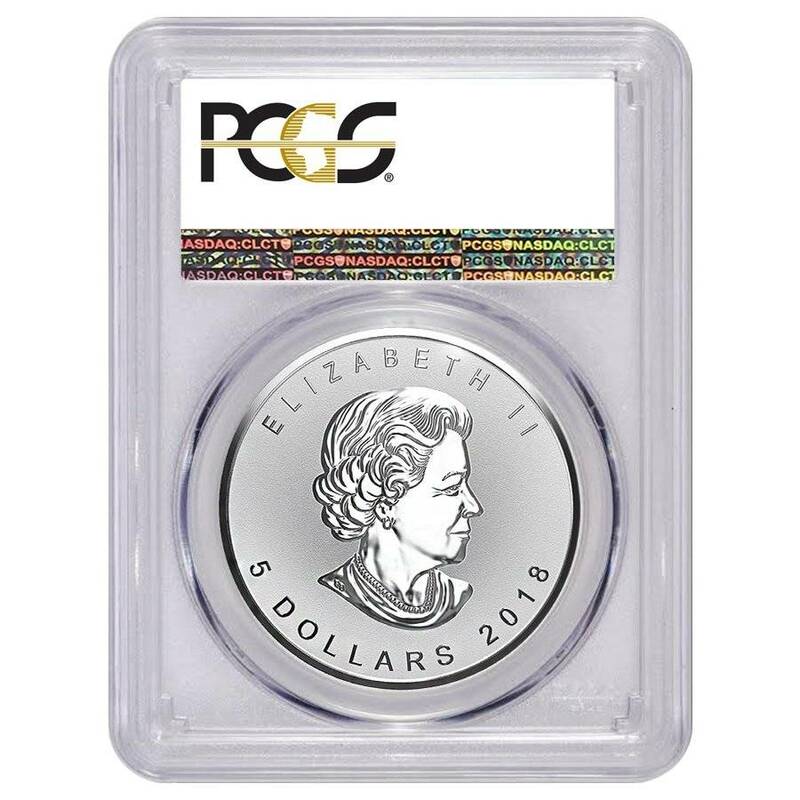 This coin is PCGS - certified with a grade of MS 69 which means that this coin is virtually almost flawless. The Lunar calendar has a separate animal featured in each year of the 12-year cycle. Those born in the year of a specific animal are said to share characteristics with that animal. People born in the Year of the Dog are friendly, honest, trustworthy, and have a strong sense of duty. Depending on which year of the cycle you’re born into, you are either Water, Metal, Earth, Fire, or Wood - those born into 2018 will be Earth Dogs with the lucky numbers of three, four, and nine. 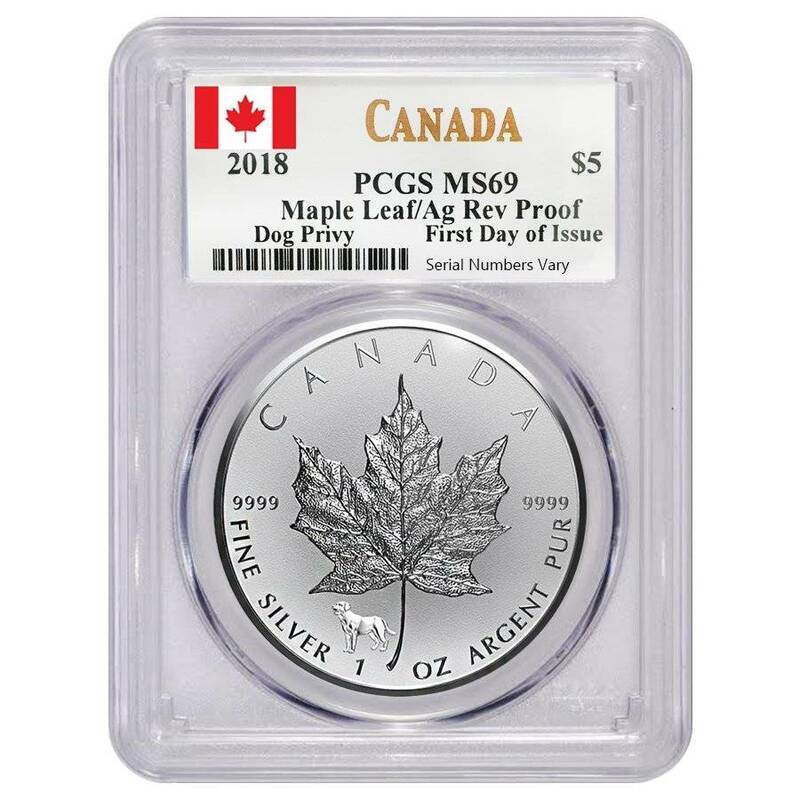 Celebrate 2018 with this beautiful commemorative coin, featuring a Year of the Dog privy mark alongside the traditional sugar maple leaf image on the reverse and the profile portrait of Her Majesty the Queen on the obverse, all on display in stunning .9999 pure silver. Made from .9999 pure silver with a weight of 1 troy oz. Produced by the Royal Canadian Mint. A face value of $5 (CAN). Mintage is limited to 100,000. Comes in a protective PCGS holder with a First Day of Issue label. Includes a Year of the Dog privy mark. 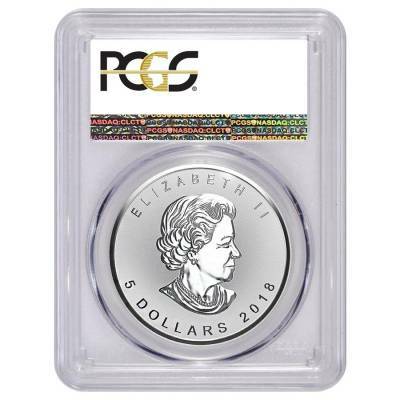 Obverse: Features the iconic image of the Royal Canadian Mint coins: a right-facing profile portrait of Queen Elizabeth II. Inscriptions include “ELIZABETH II” and its face value and year of mintage. 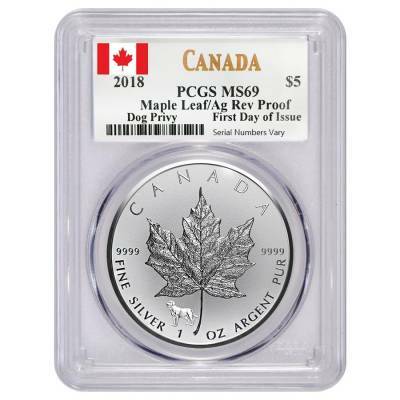 Reverse: Displays the Canadian national symbol of the sugar maple leaf along with the Year of the Dog privy mark, inscribed with the purity and weight. Bullion Exchanges offers you a wide selection of exclusive items from renowned international refineries. Add this commemorative new release to your collection today, and it will be carefully wrapped, packaged, and delivered to your address. If you have any questions, please call us at 800.852.6884, or send us a message through our convenient web portal and our friendly associates will be happy to assist you. Bullion Exchanges made this transaction easy and enjoyable. I got my Canadian Maple Leaf Dog Privy exactly as described and in just a few days. Can't wait for my next order with BE!!! My coin came perfectly packaged and was easy to order online. Can't wait for my next purchase! With this purchase, you earn 25 Bullionaire Bucks 25 BB = $0.03. We currently have 119 of this item in stock. For every $1 spend, you will earn 1 Bullionaire Buck which is equivalent to $0.001 off a future purchase. 25 BB = $0.03.